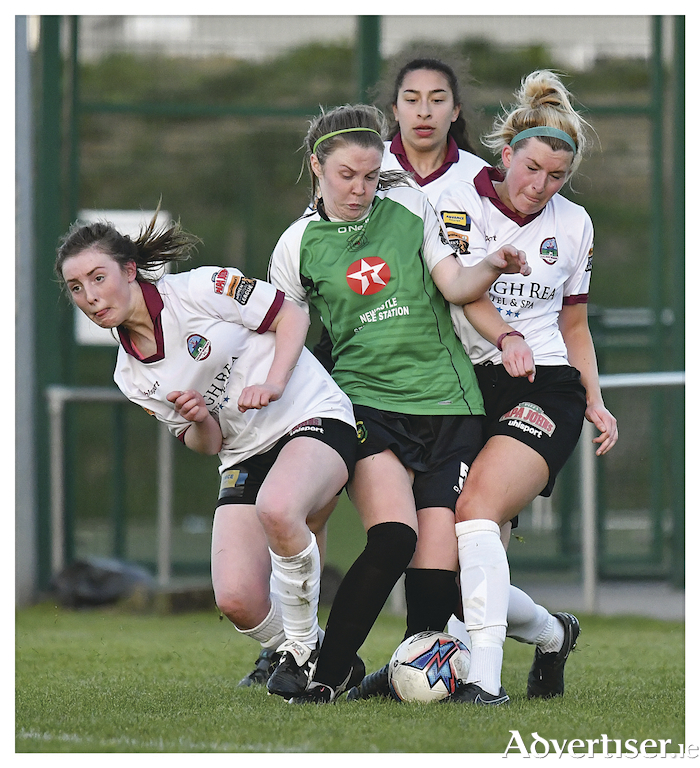 Pea sandwich: Galway Women's FC's Sarah Baynes and Shauna Fox combine to dispossess former teamate and current Peamount United star Chloe Maloney. Photo Mick O'Shea. Galway Women’s FC held league leaders Peamount United to a 1-1 draw in Dublin on Saturday evening in the Continental Tyres WNL. The first team to take points off them at home this season, Galway were forced to come from behind having conceded a goal in the first two minutes, while also losing midfielders Tessa Mullins and Chloe Singleton to injury within the first half hour. Peamount caught their visitors on the hop when Eleanor Ryan Doyle pounced to grab the opener, but Shannon native Lynsey McKey slotted home the equaliser on the 23rd minute when finishing from an acute angle. Galway then dominated the remainder of the opening period, and should have taken the lead before the break, but were wasteful in front of goal. Peamount came more into the game in the second half and were able to spring international stars Amber Barret and Heather Payne from the bench. Despite their pressing, the Galway defence was organised, composed, and coped admirably with the Peamount firepower to hold out for a confidence boasting result. This weekend the attention turns to the League Cup when Galway WFC host Kilkenny United in Eamonn Deacy Park on Sunday at 2pm. Billy Clery will be looking to build on the Dublin result and will hope Sunday can be the start of a successful cup run.